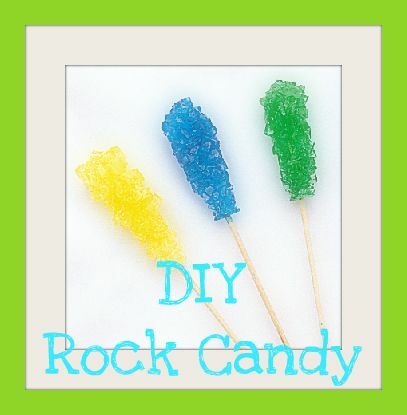 Making your own rock candy is a fun way to teach kids about how crystals form, it will be super fun for your kids to make and eat. It takes a few days for big crystals, it is fun to watch the daily progress. You can make a science experiment out of it, having your children track the progress. Over medium heat bring water and sugar to a boil, stir occasionally. You want to keep an eye on it, as you are waiting for the sugar to dissolve. You can tell this is happening because it will look clear. Once it is dissolved, remove from heat and let it cool for 15-20 minutes. Pour the sugar water into your glasses, and if you are planning to use food coloring stir that in now. At this point if you are using the string you tie it to the middle of the pencil and place the pencil on its side on top of the glass letting the string hang into the glass (you want it to touch the bottom). If you are using bamboo skewers you can just place it point side down in the glasses. Wait, watch, and get ready to eat your rock candy. You will see crystals begin in just a few hours. This makes a pretty gift, you can wrap it in cellophane and tie ribbons on it...very pretty! Did you like making rock candy? Try more recipes here!